Drugs are chemicals of low molecular mass which interacts with targets and bring about the response. The first function is the contact between the enzyme and the substrate. Enzyme contain active sites where substrate gets bound. The interaction between the substrate and the enzyme is based on different interaction such as hydrogen bonding, ionic interaction, van der waals forces. The second function of an enzyme is to provide functional groups that will attack the substrate and carry out enzyme catalyzed reaction. Drugs can inhibit the activity of the enzyme by binding to its active site where substrate molecule bind. Thus, by binding to active site of an enzyme, it inhibits the enzyme catalyzed reaction. 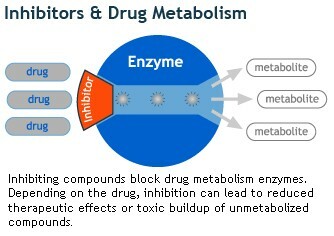 The chemicals that inhibits the activity of an enzyme are known as enzyme inhibitors. Some inhibitors act as competitive inhibitors by binding to a site where substrate molecule will bind. But if substrate concentration is much more than the inhibitor, inhibitor will not be able to bind the active site of an enzyme. Some enzymes known as allosteric enzymes contain allosteric site other than the active site of an enzyme. So, some drugs bind to allosteric site of an enzyme instead of active site of an enzyme. They modify the site in such a way that substrate will not able to recognize the enzyme. Receptors are proteins that are essential for communication. They are mostly embedded in the cell membrane. A small part of receptor is outside the cell membrane and other part is inside the membrane. The outer part of the receptor will interact with the targeted drug. Neuronal cells also communicate with each other through receptors. Certain chemicals are secreted by neuronal cells which are received by another neuron. These chemicals are known as Chemical Messengers. There are a large number of different receptors in the body that interact with different chemical messengers. Receptors show selectivity for one chemical messenger over the other because their binding sites have different shape, structure, and amino acid composition. Drugs that inhibits the natural function of drug is known as Antagonistic Drug. They are used to block the activity of certain enzymes. There are other drugs also that mimics the natural function, such drugs are known as Agonists. Q1. What is a drug target? Sol. A drug target can be any entity that is directed to change its behavior of function. Q2. What is the target protein? Sol. A target protein is any protein whose function or structure is targeted by any entity. Q3. What is a biological target? Sol. Biological target can be any biological entity who is directed for any change.